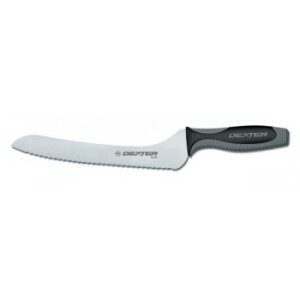 The Dexter-Russell 29323 9″ scalloped edge offset bread and sandwich knife features the new V-Lo design that is leading professional chefs into the future with its unmatched composite handle. The new handle fuses soft comfort with firm control, giving the knife an incredibly soft feel and a got-to- have attractiveness. The 29323 bread knife’s unique blade shape allows for easier slicing, and the high-carbon steel, stain-free construction permits easy cleaning. Every 29323 V- Lo knife comes with the Dex-Tex armadillo texture and protective finger guard to keep your fingers safe and away from its ever- sharp blade.